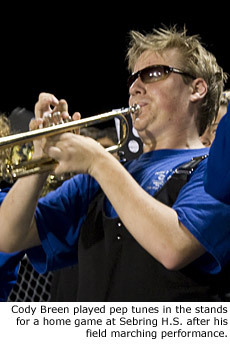 Cody Breen is a typical high school marching band trumpet player. The Sebring (Florida) High School senior has played the trumpet since the sixth grade and for fun has learned how to play keyboard, drums, electric bass and electric guitar. Okay, so maybe that makes him not quite so typical. He also plays in the jazz band and can knock off a solo without a second thought. Learning all those instruments goes along with living the philosophy taught by Cody's band director, Colorado Paniagua. According to Cody, Mrs. Paniagua has always taught him that anything is possible. So why not learn as many instruments as possible? Why shouldn't Cody, in his words, "feel like just another band freak"? While many students worry about being treated differently than others, Cody plays his multitude of instruments and marches happily around the field in a competition field show. It doesn't matter to either he or Mrs. Paniagua that's he's blind. He still runs laps with the band, does stretches and push-ups and is treated just like any other band member. Wait a moment; let's back up a bit. 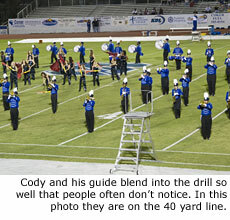 As a freshman, Cody stayed in the pit and played the trumpet while the other wind players marched the drill. Within the first week of Colorado's tenure as band director at Sebring HS, she heard rumblings that sophomore Cody wanted to march the drill. Cody asked her if he could give it a try and was surprised to hear her say, "Sure, why not? Let's do it!" Colorado had worked a blind timpanist into the marching band show at her previous school. That member was legally blind, able only to distinguish light and dark. Working with Cody would present additional challenges. Cody learned the basics of marching, including how to stand at attention and parade rest and execute a flawless roll step. However, though he was particularly adept at learning the drill, he couldn't tell where he was in relation to others in the drill. He couldn't adjust his position on sound alone. According to Mrs. Paniagua, the problem wasn't so much that Cody would sometimes be out of position. The problem was that he would be where he should be, but those around him occasionally weren't as precise with their own placements. He couldn't guide down a line or arc or dress a form. From that concern sprung the idea of a guide. 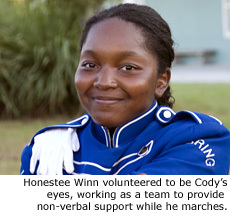 Fellow student Honestee Winn volunteered to be his eyes, working with Cody as a team, offering non-verbal support via standing behind him with her arm on his shoulder. Often, people in the standsand even the judgesdon't notice Honestee on the field because she stays in back of Cody. Colorado describes the interaction of the two students as being "almost like dancing." She once brought it up in a post-contest critique to see if any of the judges noticed, and found one who had seen someone shadowing Cody, but didn't realize Cody was blind until he was told so. During a Spirit of Sebring performance, Cody's mom was sitting among kids from another school who knew the band had a blind marcher, and they spent the performance trying to figure out which of the marchers it was. By the end of the show, they still hadn't found Cody on the field. Sometimes, caught up in the passion of teaching, Colorado has temporarily forgotten Cody's blindness. Once, when the band was sitting in the stands during a home game, Cody was having fun playing when he wasn't supposed to be. Colorado stood up, turned around, and gave him the "cut" sign from her seat at the bottom of the stands. Only then did she remember, "Oh, yeah. He can't see me." Cody learns the music by having friends play the part. His perfect pitch and astounding memory allow him to learn the music on the spot. He used to read Braille music in middle school, but listening to the part and figuring it out on his own has proven to be much faster. Some experimenting is being done with an earpiece system that might allow Cody to march without the aid of an on-field guide. Someone from a higher vantage point would provide small verbal corrections (like "a little to your left, back up a step") to help make him even more independent on the field, but it's not yet known how successful the system will be. None of this would be possible without everyoneincluding the other members of the band who speak highly of Codyworking as a team. While others praise Cody for his accomplishments, Cody praises Mrs. Paniagua, stating that her support of his desire to march neatly mirrors the belief, "If it can be dreamed, it can be done." Photos courtesy of Mike Sawyer Photography.